When a planned evening of intellectual conversation falls flat, the Ricardos and Mertzes opt for a night in front of the TV set. When the set breaks down, radio prevails and the four friends listen to the "Mr. And Mrs. Quiz" show, hosted by Freddie Fillmore. To everybody's amazement, Ricky knows all the answers (year of the Gettysburg address, the name of the youngest U.S. President, and the forty-eighth state), prompting Lucy to register him as a contestant. When Lucy tells Ricky about his upcoming radio stint, he becomes furious and reveals that the only reason he knew the answers was because he happened to be at the radio station while the program was being taped. Ricky: "All I know is that Columbus discovered Ohio in 1776." Lucy beats a hasty retreat to Freddie Fillmore's office to withdraw Ricky's name as a contestant, but Fillmore is so excited about having "a big-name entertainer" on his show, Lucy can't bring herself to break the news. But she does manage to "steal" the answers to the three questions, later committing them to memory. Unfortunately, just before showtime, the questions are switched and Lucy's memorized answers provide the hilarity. "Question one: What is the name of the animal that fastens itself to you and drains you of your blood? The collector of Internal Revenue; Question two: What is a senator's term of office? The sap runs every two years; Question three: Why did the French people put Marie Antoinette under the sharp blade of the guillotine? To scrape the barnacles off her hull." Much to their collective surprise, the Ricardos answer the bonus five-hundred-dollar question correctly, "What did George Washington say while crossing the Delaware? ", because Ricky happens to blurt out, "Please let me sit down. This is making me sick." 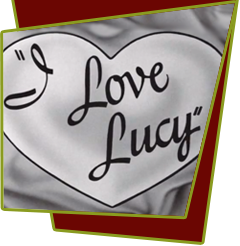 Special Notes: This episode is based on lucy's radio show, My Favorite Husband, Episode #15, "Quiz Show". Bloopers: On the quiz master award, there is not enough room to finish the sentence that begins "For Outstanding Performance..." and the last word of the sentence is gibberish.